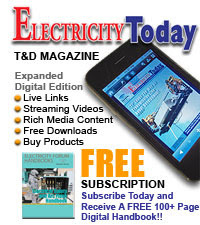 The nonuniformly on the voltage distribution over a string of suspension insulators is expressed in terms of a parameter called ''string efficiency'. The string efficiency is defined as the ratio of total voltage across the string to the product of number of units and the voltage across the unit adjacent to the line conductor. The string efficiency is calculated based on the string used for each line and hence the voltage across the string is the voltage of conductor with respect to earth i.e. phase voltage. More the value of the string efficiency, more uniform is the voltage distribution across the string. For the ideal case, the string efficiency is 100% and the voltage across each disc of the string is equal. Practically various methods are used to obtain the string efficiency as high as possible. In the rainy season, insulators are wet and the mutual capacitance value increases. 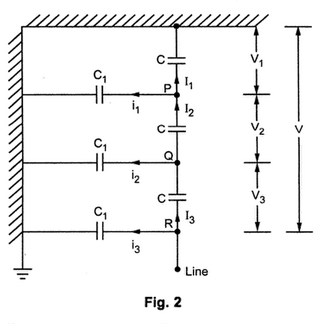 Thus the ratio of shunt to mutual capacitance i.e. k decreases. 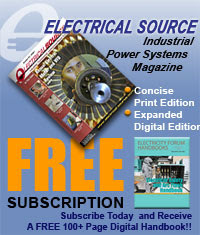 This increases the uniformity of the voltage distribution. Hence in rainy season, string efficiency is higher. The current through capacitor is the ratio of voltage across capacitor and the capacitive reactance of the capacitor. 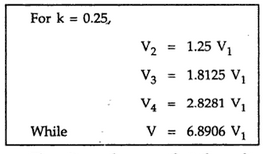 This is because the voltage across C1 is V1 . 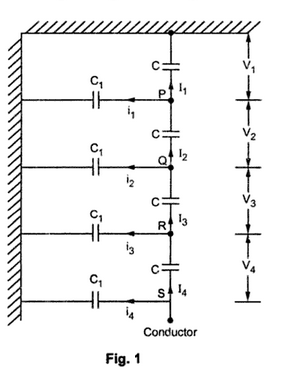 Note that the voltage across the shunt capacitance C1 carrying current i2 is V1 +V2. 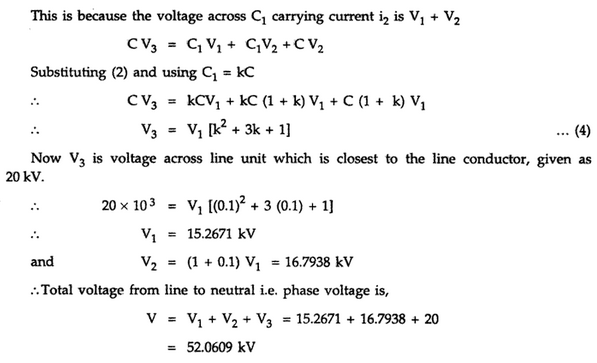 Hence using equations (2), (4) and (7) all the voltages for given value of k can be calculated. Thus it can be seen that the voltage across the unit nearest to the line conductor is maximum. Thus for n = 4 and k = 0.25, the string efficiency is just 60.91 %. More the value of k, greater is the nonuniformity and lesser is the string efficiency. While as the number of units is a string increases, the string efficiency decreases and its calculation becomes much more tedious. Hence the string with less number of units is more effective.